Chiapas is Mexico’s southernmost state, known for being home to impressive Mayan archeological sites, such as Palenque, and for its large indigenous population, which has suffered greatly under five centuries of colonial rule. In many ways Chiapas is still struggling to come to terms with its inclusion in the federal state, as was exemplified by the 1994 Zapatista uprising, which succeeded in obtaining new rights for indigenous people, and which remains a force to this day. The governor of Chiapas is Manuel Velasco Coello of the Green Party, or PVEM. It is important to note that the Green Party in Mexico is a farce. The PVEM is extremely socially conservative, having been on the record as opposing LGBTQ+ rights and favoring the death penalty. It has limited involvement in meaningful policies that support the environment. In Mexico, the Green Party is allied with the Institutional Revolutionary Party, or PRI, which ruled Mexico for most of the 20th century. Mexico’s incumbent president, Enrique Peña Nieto, is a member of the PRI. Velasco Coello himself comes from a political family – his grandfather is former Governor Manuel Velasco Suárez. Though Velasco Coello was born in the state capital of Tuxtla Gutiérrez, he represents the minority criollo population of descendants of European settlers. His wife is “Anahí”, a former singer and actress who was born in Mexico City and lives in Los Angeles. Chiapas is one of the nine states electing a governor in what will be, all told, Mexico’s largest elections in history. The gubernatorial candidates are Roberto Albores Gleason of the PRI-PVEM-PANAL alliance named “Todos Somos Chiapas” (We Are All Chiapas); Rutilio Cruz Escandón Cadenas of the Morena-PES-PT alliance which functions under the banner “Juntos Haremos Historia” (Together We’ll Make History); and José Antonio Aguilar Bodegas as part of the PRD-PAN-MC coalition. Lenin Ostilio Urbina Trujillo almost got on the ticket as an independent – until the electoral institute determined that almost 45% of his supporting signatures were false. Of the three senators from Chiapas, two are from the PVEM, and the third is from the left-of-center PRD – which now, oddly, find itself in a coalition with the right of center PAN. Despite its reputation for social unrest, some of which continues to this day, comprehensive data from Semáforo Delictivo for the first three months of 2018 indicate that Chiapas is in fact the safest state in Mexico. Chiapas’s homicide rate was 2.6 per 100,000 inhabitants in the first quarter of this year, below the average in the United States of 5.35 (2016), but above Canada’s rate of 1.68 (2016). This data coincides with other recent reports by non-governmental and official agencies. Which is to say, violence and security won’t top the list of election issues in Chiapas. Instead, social justice issues such as poverty, land rights, and education will be front and center. The challenge is that much of the populace is illiterate and poorly informed. Elections in Chiapas have always been rigged. The local population is severely alienated from the electoral process, and doesn’t feel represented at any level of government. This is why people in Chiapas tend to take the law into its own hands. In May of this year residents of the Tzotzil community of Los Plátanos in the municipality of El Bosque demanded that Mayor Martín Gómez Díaz release 18 million pesos (US $910,000) which had been allocated to a municipal development committee. To press the issue of the unpaid development funds, residents kidnapped Ramiro González Patishtán, the husband of a municipal official, Herminda López Pérez, and threatened to burn him alive. This was no idle threat: the kidnappers released a video of their captive tied to a pole and standing on some kindling. Luckily, the municipality of El Bosque said it would live up to its word, and González Patishtán was released unharmed on June 2, 2018, after being held for 20 days. In another recent incident, a judge and four court clerks from Chenalhó were held hostage for 22 hours in the neighboring municipality of Aldama, and only released after 100,000 pesos (US $5,120) in ransom was paid. The core of the dispute is over 59 hectares of land located in Chenalhó, but over which Aldama claims ownership. In April, the Bartolomé de las Casas Human Rights Center said gunfights were increasing in several towns in Aldama, forcing some terrified residents to flee. Added to this are the frequent roadblocks set up by protesting teachers, many of whom demand payment from stopped vehicles. This has been a particular problem on the highway near Ocosingo (Palenque to San Cristobal), which is now avoided by most buses. In some instances trucks have been set on fire, with hundreds of police deployed to keep the peace. These kinds of localized disputes can have negative spillover effects. At the end of April two European cyclists were murdered along Highway 199, with their bodies thrown down a ravine. Officials believe that the initial motivation was robbery. To date, there has been no police presence in the area, despite the fact that the general lack of security in the area has been heightened over the years due to an ongoing political conflict in the nearby municipality of Oxchuc. And as is true elsewhere in Mexico, the presence of resource-extraction companies has created instability. One of the most notorious examples is Canada’s Blackfire Exploration, which has been implicated in the 2009 murder of Mariano Abarca, who was protecting the company’s “Payback” barite mine Chicomuselo. The company denies any involvement in the killing, but the family continues to press for answers. This is because before his death Abarca, facing threats by Blackfire employees, appealed directly to the Canadian embassy, which did nothing. To this day no one has been convicted of the crime. There is also the matter of an allegedly illegal landfill in Tuxtla Gutiérrez, which is now subject to a complaint before Chiapas’s Human Rights Commission that claims that 27 people have lost their lives due to diseases related to environmental contamination. In the weeks following his death, there were large protests in a nearby town. Three men were arrested in connection with his murder and the earlier beating -- one current employee, and two former employees. Later, they would all be acquitted and released. Nobody else would ever be charged. In the end, the mine was shut down soon after by the government over environmental concerns and has not reopened. The company denied any involvement with the killings. In this climate, it would seem that a candidate like Rutilio Cruz Escandón Cadenas of the Morena-PES-PT would be a shoe-in. But that would be to ignore the depth of the corrupt systems that the PRI-PVEM-PANAL alliance has in place. The fact that Manuel Velasco Coello was elected under the PVEM banner in 2012 at age 32 – the youngest person ever to be elected governor in Chiapas – is proof of the strength of the machine. In all likelihood Roberto Albores Gleason of the PRI-PVEM-PANAL coalition will win. And for president? The three main choices are: José Antonio Meade of the ruling PRI as part of the “Todos por México” (All for Mexico) coalition with the PVEM and New Alliance (PANAL) party; Ricardo Anaya for the PAN-PRD coalition; and Manuel López Obrador (known as AMLO) running as the head of the National Regeneration Movement (MORENA) as part of a larger coalition called Juntos Haremos Historia (Together We Make History). Within that list of three, AMLO would be the clear choice. 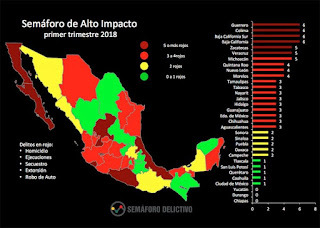 In Chiapas there’s usually a healthy amount of ballot stuffing and vote buying in support of the PRI, but this time the federal rules might be harder, and the party will be preoccupied in its efforts to manipulate the vote at the state level to ensure that Roberto Albores Gleason wins the governorship. (NB: Chiapas has been a rough place to be a journalist over the years, with the first recorded murder being in 1886. There was one killing in 1930, and another in 1942. Things were quiet for four decades, then two journalists were murdered in the 80s (1988, 1989), and three in the 1990s (1990, 1992, 1993). One journalist has been killed in the 21st century (2006). Despite the unrest in Chiapas, the state has manged to steer clear of much of the insecurity related to the drug war, which has put many journalists' lives at risk).